Discussion in 'Hatch-A-Longs' started by GardeNerd, Jan 29, 2010. Trader Joes Egg Hatching Club Anyone? Do you want to be a member? Post a link to a thread about your project, show us a picture, or write a comment to join! It seems there are lots of folks who have tried hatching eggs that were intended to be breakfast from Trader Joe's or other natural grocery stores. Some folks have posted about it here on BYC. How many other grocery store chicks or chickens are out there that were hatched out of fertile store eggs, or at least how many people have tried incubating store bought eggs? I am member. I currently have one Trader Joes chicken, Joey. 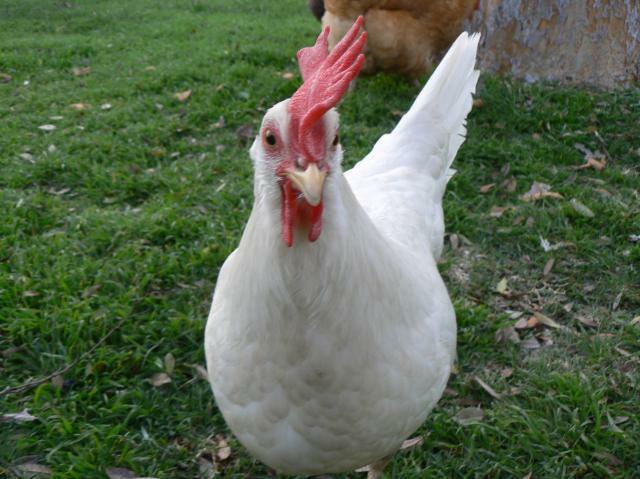 She turns 1 year old on Feb. 3rd and she is a leghorn hybrid. Here is a link to the thread about it. heh, I just love those little fuzzy yellow peeps. 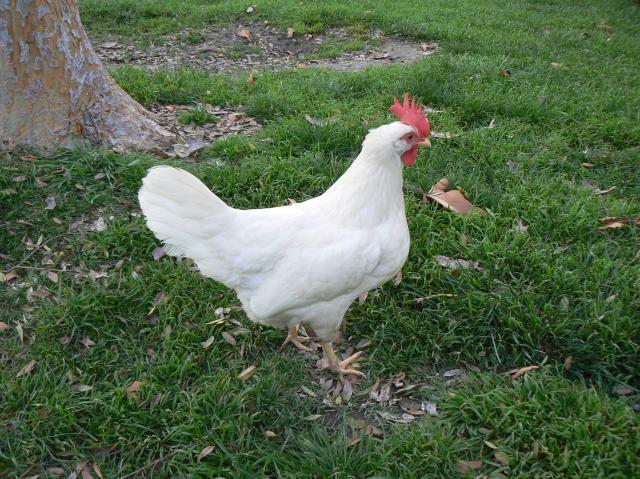 This is JoJo, the one pullet we kept, at about 9 months. She started laying at 16 weeks and laid 9 days out of 10 until molting. 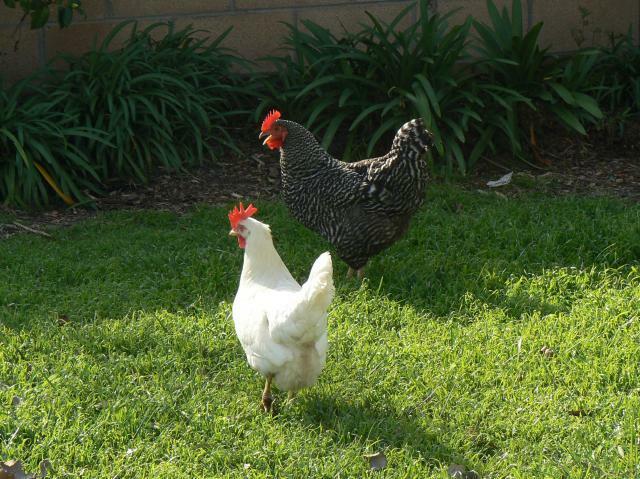 I had to give the roosters away at 4 weeks because they were too rowdy; too many plucked feathers and a bloody comb. This was in a 6'x6' square brooder on grass. Thats a 10'x10' square chicken tractor they're in and I have since set it up on blocks so they can free range within their pasture. I do have somewhat of an ethical issue with hatching these eggs though. These peeps seem to really have a hard time hatching as compared to other peeps I've hatched alongside them. My own hypothesis is that this lack of vigor is due to the low quality diet fed to the commercial flock. Then again, Slickchik's hatch rate just blew mine away by at least 50%. On TJ's eggs, that is. Oh, and it was GardeNerd's science project thread that inspired me to try this. I love seeing the photos of them! So you can tell who the boys are pretty early on? Joey was the only chick that got to stay here more than two weeks out of our hatching, so I didn't get to see how the genders developed or how fast. I like your website! Especially where it shows the TJs eggs as a control/ comparison in your bantam ameraucana egg hatching. Yeah, you can tell the gender pretty quickly. I think in most cases after a week to ten days...that comb just starts to really take off on the baby roosters. Some of them, you can just tell by their body language from Day 3 or 4. These little fellas are roosters through and through. The longest I've ever been able to keep one was 12 weeks and he sure was a beauty. I set a dozen TJ's eggs in December. The eggs were 3 weeks old when I bought them, so I didn't have much hope. Only one hatched on day 23, (Dec 28th). Little T.J. is growing like crazy and doing well. Pretty sure she's a girl, hardly any comb at 4 weeks! yippee! Quote:Those were the same kind of results we had with our Joey. Any pictures of your TJ? Sure! Here she is today, 4 1/2 weeks old. She is still about half the size of all the other chicks hatched at the same time. Very sweet though. edited to actually add the photo! Duh. I just took pictures of Joey. Here is my Trader Joes chicken. I'd sure love to be able to keep one. How hilarious would it be to show one? Quote:He is a handsome fellow!